Update: This webinar is complete. To view the slides as well as Q&A, click here. Want to learn more about social, local, and mobile channels and the importance of integrating SoLoMo into your online marketing strategy? 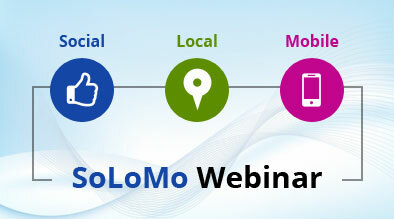 Milestone presents our next session in free online webinars with SoLoMo. Sign up to learn about the importance of SoLoMo and how to integrate the strategy into your marketing plan. Social Channel Overview – why is social marketing important? Local Channel Overview – why is local marketing important? Mobile Channel Overview – why is mobile marketing important? 6. Integrating SoLoMo – Who, Why & How?